Breakfast is by far my favorite meal. I don’t often miss it. In fact, I’m pretty cranky by 10:00 a.m. and eat like crud all day if I do. The problem that I run into is that way too often I am running late in the morning so I grab something that is quick but likely unhealthy—its usually carb-based (bagels, breakfast sandwiches, etc.). Well, I am on a mission to eat healthier and that means planning ahead, which set me on the hunt to create a breakfast that is different, filling, and healthy. 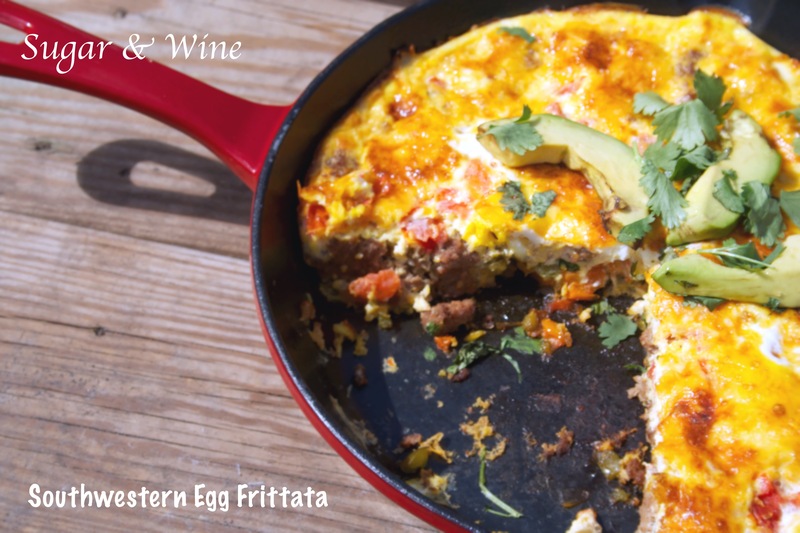 This Southwestern Egg Frittata is amazing! It has fresh vegetables and herbs and a bit of a bite to it. All of it comes together for the perfect way to start your day. I save the left overs (without the avocado and cilantro) then reheat it all week long. Cook one time and eat all week is a great strategy if you are cooking for one or two. This frittata is also the perfect breakfast choice when you have guests at your house too! Pre-heat the oven to 300 degrees. Cover your iron skillet with one teaspoon of olive oil. I use a paper towel to make sure it is covered. Don’t forget the sides since the frittata will expand. Set aside. Next, brown the ground turkey in a skillet (not your iron skillet). I didn’t have to drain anything but if you do have any grease, you should drain it off. Then, mix in the taco seasoning and the water. Let it cook, stirring until it thickens. Set aside. Chop up all of your veggies to your liking. In your iron skillet, toss in the onions, garlic, and peppers and let them cook on medium low while you prepare your egg mixture. Finally, whisk together the eggs and milk. Then, pour the mixture in the iron skillet full of vegetables. I add in the tomatoes at this point because I don’t like my tomatoes broken down. Finish by adding cheese on top. Once you remove the skillet from the oven, top it with sliced avocado and cilantro. Cut and serve immediately. **Note: everyone’s oven is different. When it comes time to broil, keep an eye on it. It may need more or less time. This recipe is adapted from The Nourishing Home.